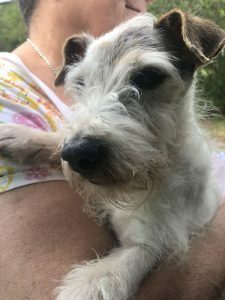 Spotlight Terriers - Russell Rescue, Inc.
Russell Rescue Needs Your Help! Sweet little Bridget had her surgery on Wednesday the 17th and is home resting and recovering. The doctor had to remove 6 teeth and also clean and scrape all the remaining teeth, then stitch up the holes. Ouch! 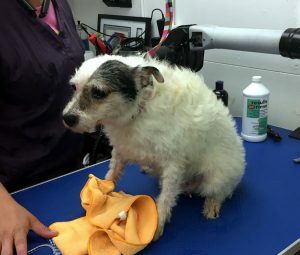 Bridget also had a lump on her shoulder that had to be removed. You can see her stitches in the photo. Bridget had the best care in the world from Dr. Mark Schuman, Virginia, Miss Tracy, and Amber. They are a great team and we appreciate them so very much! They took great care of our little girl! Bridget has had quite a bit of pain, but her foster mom is giving her good meds and lots of TLC. She is doing a lot of sleeping today. Thank you to the donors who made this life-saving surgery possible. Bridget will now have a chance at a healthy and happy life. We reached our goal for Bridget and her surgery is scheduled for Wednesday! Thank you all so very much for donating! We appreciate it very much! We will post updates this week. 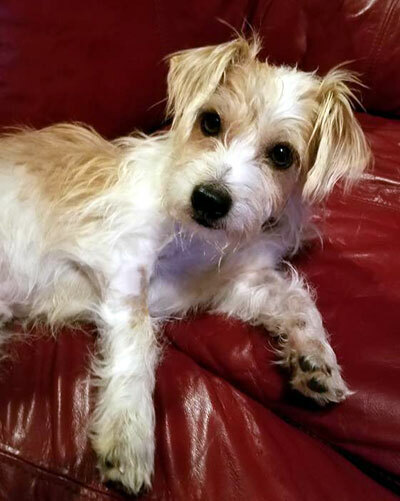 This precious little gal is Bridget, and she needs our help! 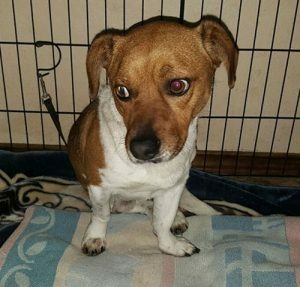 Bridget is a sweet little senior Jack Russell that has a mouth full of rotten and infected teeth. As you can see from the photos, her teeth are in very bad condition. 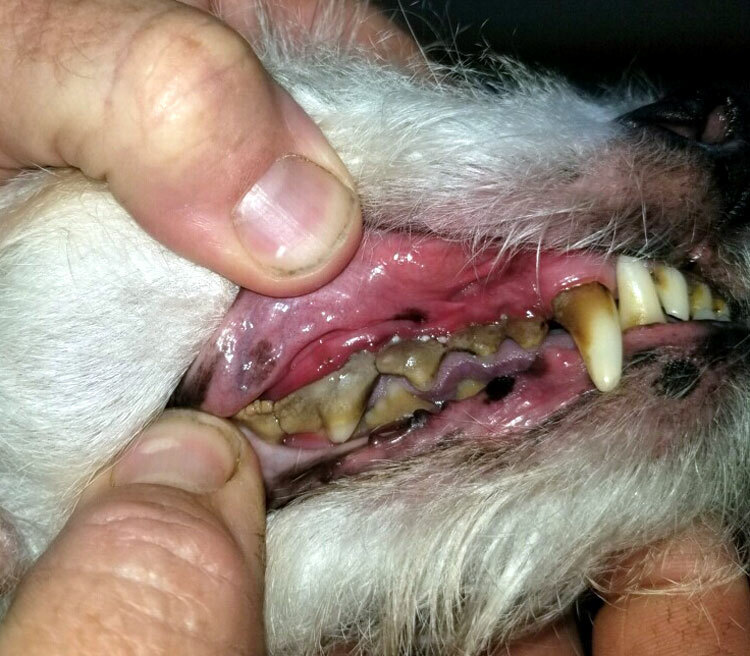 Her back teeth are a greenish/blackish color, and the infection is poisoning her little body. 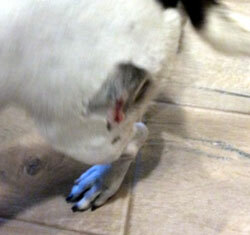 The vet says that most of her teeth will have to come out and that she will need stitches. 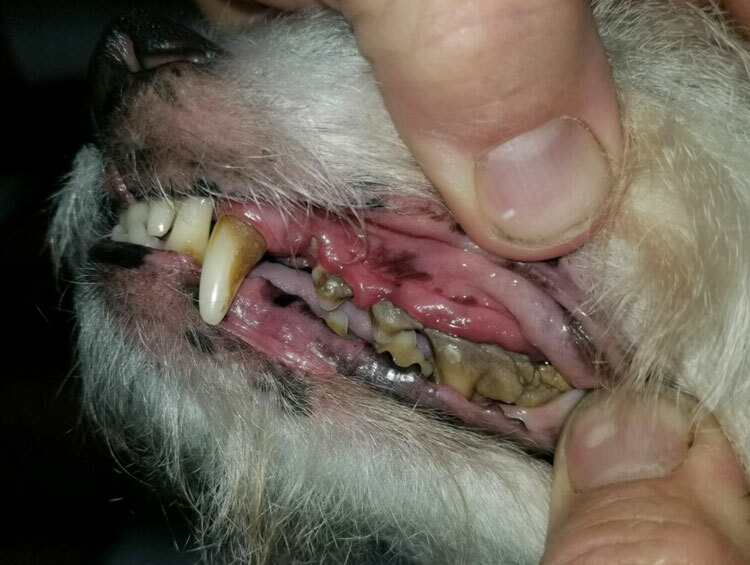 Bridget’s bad teeth are causing her pain and need to be fixed as soon as possible! The vet estimates that the bill for Bridget’s surgery will be around $700. 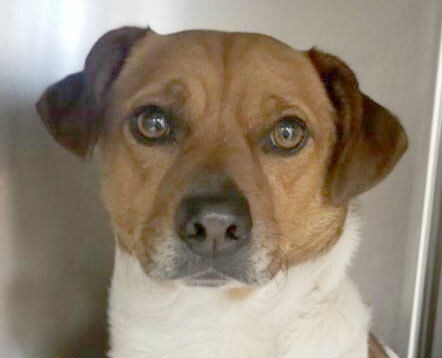 Bridget is a sweet little gal who deserves a chance at a healthy life. 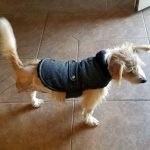 Can you please help our girl get this life saving surgery by donating? No amount is too small…it all adds up! 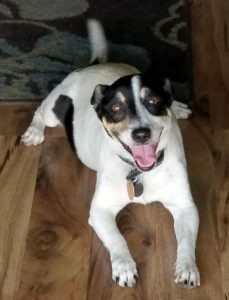 You can donate at www.russellrescue.com with PayPal and all major credit cards. Please notate that your donation is for Bridget in the name field. Russell Rescue, Inc. is a non-profit 501(c)(3) corporation. Donations made to Russell Rescue, Inc. are tax-deductible to the contributor. Follow along here for updates. Thank you from Bridget! We wanted to thank each and every one of you who donated to Cappy’s fundraiser. We reached our $1200 goal as of 2/7/19! Your continued support means so much to us and also to these precious little dogs. Without you, we couldn’t do what we do! So, thank you, from the bottom our our hearts! 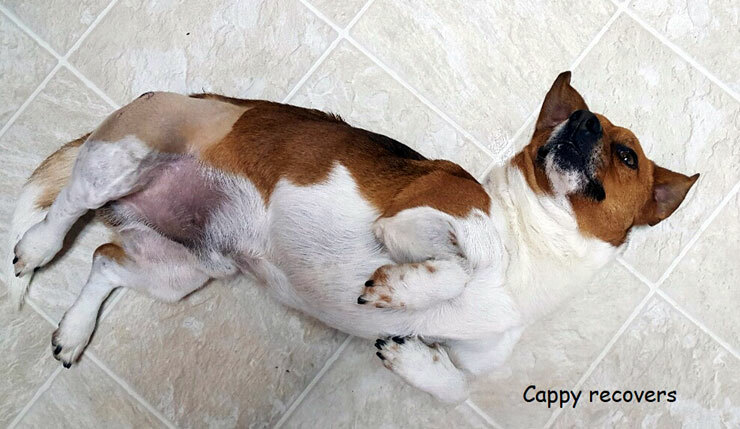 Feb 7 -We got an update on Cappy from his foster mom! Cappy is doing well. 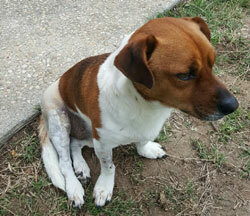 He is starting to put his leg down a little bit, so that is good progress! He has a good appetite and is eating well and seems to be happy. He has a couple of nurses taking care of him, as you can see from the photo. 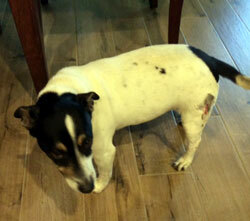 He had a follow up at the vet this week because a couple of his sutures were coming out. The vet put staples in to keep the incision together. Other than that, Cappy is doing great! We have raised $955 so far. That leaves us $245 short on the vet bill. 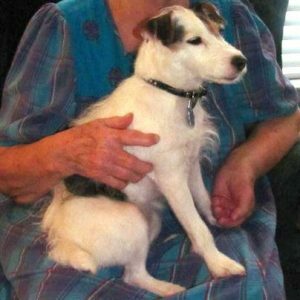 If you can donate to Cappy’s fundraiser, we would appreciate it! No amount is too small…it all adds up! You can donate with PayPal and all major credit cards. Please notate that your donation is for Cappy in the name field. October 29 – Our sweet little Alyse has been adopted and is as happy as can be in her forever home! We appreciate our supporters so much. 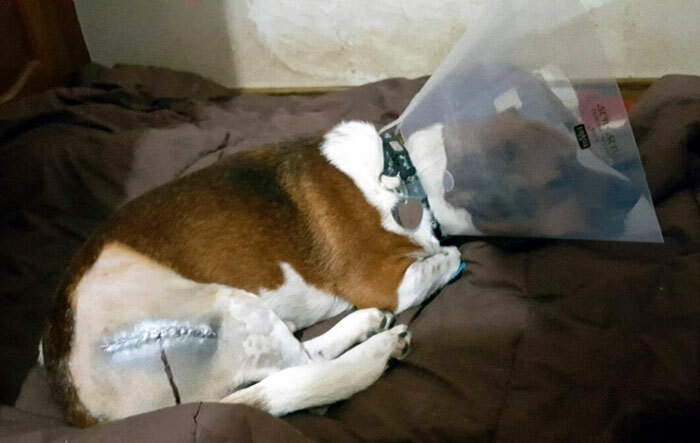 Alyse got the medical care she needed because of your donations and now she is finally home! Happy Tails Alyse! June 15 – We got this update today about Alyse and wanted to share with all of you. Thank you all again for your donations to her vet bill. We are hoping she is ready to find her forever family soon! Alyse had her dental today. Our poor baby had 18 teeth pulled! 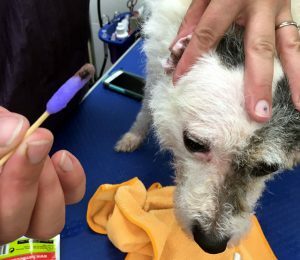 Plus, the vet noticed that she had a wax plug in one ear. It was a quarter inch long and hard as a rock. It’s out now! June 10 – We want to say thank you to everyone who donated to Alyse! We reached our goal and Alyse is scheduled for her surgery on June 14th. She will be one happy girl once those teeth are fixed. We can’t tell you how much your support means. We couldn’t do it without you! Thank you from Alyse! Stay tuned for more updates. Alyse needs our help! She looks perfect and adorable, right? She is adorable, but what you can’t see is her horribly rotten teeth. They are so rotten, one of them just fell out in Robyn’s hand! 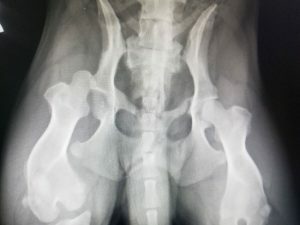 The vet snapped several photos that are posted here. 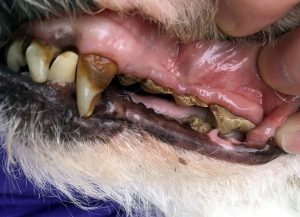 Her gums are filled with pus and the teeth are loose. 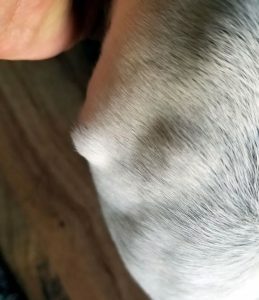 The vet says there will be around 6 extractions. 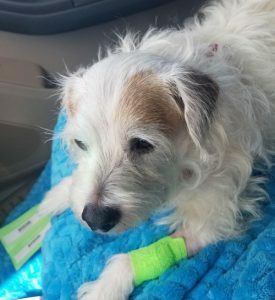 Please help our sweet girl! In order for Alyse to be ready to find her forever family, she must get her teeth fixed. Her little mouth is painful and the extractions need to be scheduled as soon as possible. The 6 extractions will run about $600. Please help us help Alyse by giving. No amount is too small… it all adds up! Please notate that your donation is for Alyse in the name field. Follow along here for updates. 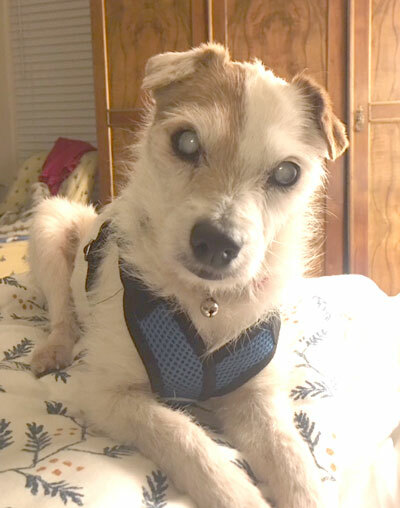 Update: Oct 7, 2018 – Update on Gracie! We reached our fundraising goal! Thank you so much to those of you who donated. 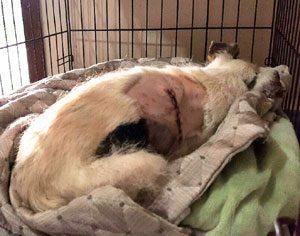 Gracie had her spay surgery and dental cleaning last week. She also had a bump removed from her rear end. She is recovering nicely and is wearing a cone. She is on the road to recovery. It won’t be long now before we can start looking for the perfect forever family for Gracie. Thank you so much for your support! Follow along here for updates. 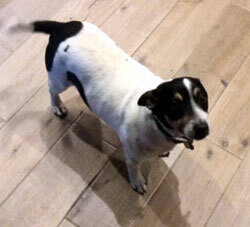 You will probably remember this little Jack Russell (previous story). Her name is Gracie. One of our volunteers from Iowa saw her photo on Craigslist back in July. 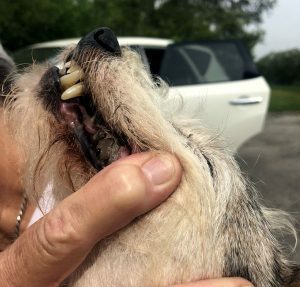 She suspected Gracie was from a puppy mill, and she was right. 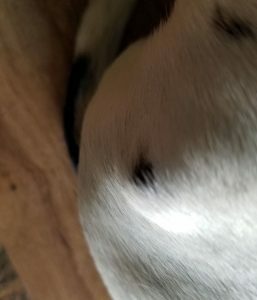 Gracie had spent most of her life in a barn birthing puppies. She is about 7 years old. During that time, her breeder fed her mushy puppy food. As a result, her teeth are a mess. 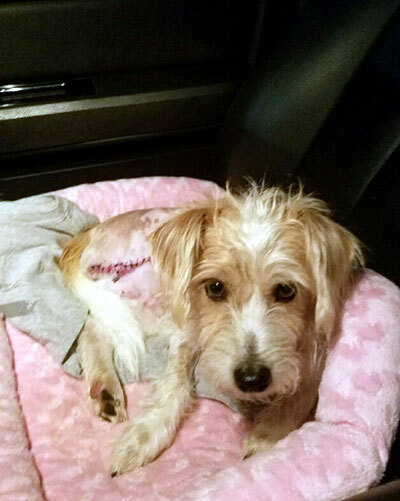 After her journey from Iowa to Texas in July, Gracie has made great strides. She is safe and sound in a foster home near Sherman, Texas. She is learning how to be loved and cared for properly for the first time in her life. Gracie is now ready to get her vet work done. She needs to have a dental cleaning and also needs to be spayed. When we first got her, she was overweight from eating all the puppy mash, but she is now a healthy 19 pounds and is ready for the rest of her life to start. 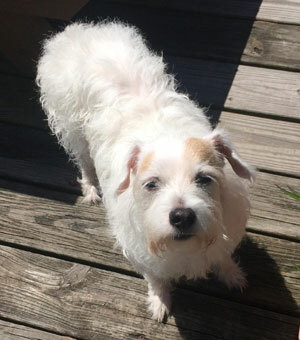 We would love to get her vet work done so that we can begin the process of finding Gracie a forever family. The vet estimates that Gracie’s spay surgery and dental cleaning will run about $600. Please help us help Gracie by giving. No amount is too small…it all adds up! You can donate on our site with PayPal and all major credit cards. Please notate that your donation is for Gracie in the name field. Russell Rescue, Inc. is a non-profit 501(c)(3) corporation. Donations made to Russell Rescue, Inc. are tax-deductible to the contributor. Follow along here for updates. Thank you from Gracie!